2007 was a productive year for The Bioscope, from small beginnings, and I hope that the coming year will see the service continue to gow and for the archive of useful content to build up. In 2008 I’ll be continuing to provide news on events, festivals, conferences, screenings, DVD releases and online resources for early and silent cinema. The Library of freely-available digitised documents will continue to grow (there is quite a backlog of titles to be added in due course), and I hope to add new features and maybe indulge in a redesign somewhere along the line. However, the major theme running through 2008 will be colour cinematography in the silent era. 2008 sees the centenary of the first public exhibition of Kinemacolor, the world’s first natural colour motion picture system. 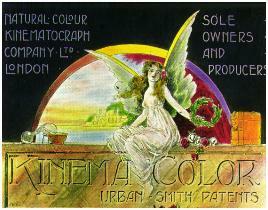 Pedants may say that the centenary of Kinemacolor might have been 1906/2006 (when it was patented), 1907/2007 (when it was exhibited in a preliminary form to an audience of film professionals) or 1909/2009 (when it was first called Kinemacolor and was first exhibited to a paying public). But 1 May 1908 was when the system was first shown to a startled general audience at Urbanora House, Wardour Street, London – and that’s good enough for me. So throughout 2008 there will be posts on colour cinematography to 1930. Not just Kinemacolor (though there will be plenty on that), but the experimental efforts that preceded it, hand-painted and stencil colour, tinting and toning, Biocolour, Cinechrome, Chronochrome, Kodachrome, Prizmacolor, Technicolor, Polychromide, Kodacolor, and more. There will be potted histories, archive documents, illustrations and (if I can find them) film clips. It’ll all build up into a year-long series to cherish and keep. Keep reading, keep commenting, and tell your friends.